Yesterday I had a pleasant customer service experience with Delta in Seattle, which impressed me so much. But after thinking about it for a bit, I realized that it was just a sad reflection of how low my expectations of service at the “big three” US airlines have become. For the most part I find flight attendants to be friendly and airline phone agents to be well intentioned, if a bit incompetent. However, the level of service from airport customer service agents at the major US carriers has been on a downward spiral for years. There are some good employees out there, no doubt, but on average I’m happy if the service I receive is somewhere between what I’d expect at a DMV and a Ross. A few weeks ago I was flying United in first class out of Houston, and missed my flight. When I asked for help rebooking (and was happy to pay) the agent let out an audible sigh, walked ever-so-slowly to the desk, and had an attitude, on top of having no clue what she was doing. American wants their customers to use self service options as much as possible, to the point that customer service agents who are standing around and doing nothing aren’t allowed to help you. This brings me to yesterday. I was flying Delta out of Seattle, and noticed my Known Traveler Number wasn’t on my reservation. I tried to use a kiosk in the non-elite section to add it, but didn’t see the option to do so. She wrote down my Known Traveler Number, ran to a desk (like, actually ran), and a few moments later returned with a new boarding pass. Now, in fairness, let me say that every single Delta employee I interacted with in Seattle was incredibly professional. I’m not sure if this is a Delta thing or a Seattle thing, or a combination of both, but they were just fantastic across the board. However, it makes me sort of sad how the above interaction left me stunned in a positive way. What does it say about the big three US airlines when simply offering to help a customer feels like going above and beyond? A customer service agent doing … service? For a customer? As simple as this was, it’s important to give credit where credit is due. It’s the only way to ensure the competition follows suit. It’s Delta, dummy. Their loyalists come back because it’s the best domestic airline – SkyPesos be damned. Delta in my experience has hands down the best service and most helpful employees, while American and United swap spots in their race to the bottom. a good strategy by big the 3 – (training customers in) going in with very low expectation has its advantages. they will be brought to tears and full of appreciation with the occasional show of competence and attention. Yeah – Score! It costs $0 to be friendly. You’d think it were a million dollar item by the way many “customer service” people act at airports! I had a similarly impressive experience with an AA agent at LAX recently. Three of us were struggling to add the KTN to my reservation at a kiosk, and she whisked us over to the priority check-in to handle it for all three of us, as well as re-arranging our individual bookings so we were seated together, along with giving us a priority boarding zone. We must’ve caught her in a good mood, as I’ve never met someone so helpful who works for an airline, especially at LAX. Not everyone working in airline customer service is an ogre, but it’s certainly getting more rare to get proper service, so I think your surprise is warranted. The interaction showed above average customer service because the agent initiated the offer to help, was prompt, addressed you by name and verbalized understanding the need to add the number to avoid unnecessary wait at the TSA line. A FA would show those qualities by inquiring about allergies, preferences in frequency of interaction during quiet times and special needs during arrivals. Delta (the airline you rip on the most) treats me unbelievably good. Always accommodating and friendly. I’d partially blame the social media platforms where people threaten businesses with social media shaming & bullying if they don’t comply with their outrageous demands. We can start with those who film interactions of employees without their permission, and frequently, without their awareness either. Airlines employees aren’t public servants, so why are people treating (and abusing them) as such ? I have almost always had very good interactions with Delta ground staff. I particularly remember a very lovely woman named Easter, who was a DL gate agent at MEM (from back in the days when MEM was a DL hub). I was doing my usual LIT – DCA run, this time with a connection at MEM. The DCA flight was experiencing a rolling delay and everyone was getting frustrated. But nothing could sour Easter’s infectious cheerfulness. She regularly made updates, even if there really wasn’t any new information to offer. She would sit and offer a sympathetic ear to individual passengers who were getting upset. She readily offered a smile or a laugh to anyone who approached the podium. It was such a delight watching her in action and I do hope she is still with Delta. In a utopian society, such examples of customer service would be the norm. But of course we live in a more frantic age where the Easters of the world stand out like a shiny beacons in the night. Based on my own experience, Delta’s culture seems to still value good customer service; no doubt the “GOD!! How I hate Delta! !” crowd will soone be chiming in with rebuttals. US Big three? lol Last week I walked into Alitalia club in Rome. The agent (lady) behind desk was filing her nails. She looked up at me and back to her nails and continued without saying a word. I cleared my throat, that didn’t help. Rather than reaching over the desk and pulling her over the counter by her neck, I patiently waited. Finally another agent (male) walked up and helped with a smiling face…. Welcome to the 99%, Ben! Jokes aside, this is par for the course for Delta and the reason I choose them first for all Domestic flight. Echo what others have said. It’s why I keep coming back to DL despite SkyPesos. By far the best employees among the US3 and consistently so. Are their bad apples? Of course, but far less than on AA or UA. Switch to Southwest. I have slightly higher expectations with them, as their employees don’t seem to hate their jobs. It’s the Delta way! I used to think it was just southern hospitality for the ATL airport staff and flight crews, but it’s true of most of their folks nationwide. The hub with the least “Delta-like” service (in my experience) is MSP which i can only write-off to an NWA culture hangover. Even the SkyClub personnel at MSP lack the basic friendliness I expect from Delta, so I head to the Escape Lounge where they’re much friendlier and the food is better. This is Delta. Great employees. Thieves for executives. With the big 3 monopoly I just go by personal experience, managment, stock prices, and the analysts at CNBC etc. Delta is first. AMR and CAL last. UAL is pretty shanty. So is USAir but at least USAir’s shareholder returns are better. Do people memorize their Known Traveler numbers? I sure don’t. Pretty smart of Delta to invest in something the competitors lack and have direct impact to customers. I had a Japanese flight attendant roll her eyes when I ordered too much for breakfast on Cathay pacific f class. This was after I had skipped dinner and there were only two passengers between two flight attendants. Well, you’re too young to have experienced the demise in so-called ‘service’ over 50 years. But let me assure you, the downward trajectory began decades ago. It’s true, low expectations, that I am impressed when I find workers who actually can do the job correctly for which they were hired and paid. It’s grim out there. That said, I had a thoroughly stellar experience recently with Qantas. Every employee I encountered were professional, competent, glad to be helpful, and courteous. It was like that once in America. And Europe is no better. Asia, OK. I also had a good experience last year in Mexico City – Hyatt and Hilton. Though not to diss on my own country, there are still many good people who do care. And it’s very important to let them know it. A simple ‘thank you for being helpful’ goes a long way. It’s what we don’t do enough. I had a Delta FA come by my seat with her tablet/smartphone thing on a recent flight to let me know that my connecting flight was delayed by ~30 min and discuss alternative options. I was an FO on a coach ticket sitting in C+. Very surprised by the pleasant and “above and beyond” gesture. Absolutely not a delta thing. I’ve had only mediocre to bad experience with them from multiple airports. Seatac people in general do tend to be friendlier though. You may not get quite the same response at JFK, but Delta is really trying hard in Seattle as they compete directly with Alaska. A year-and-a-half ago, there was a slight delay for boarding a flight at DCA on American. American Airlines at DCA is…mostly atrocious? Anyhoo, our plane/gate changed once, and there was no plane at the “new” gate. However the boards weren’t showing a “new” new gate that had a plane, which was spooking people, as it was a nighttime flight and many people flying to JFK on this flight were connecting internationally. About two minutes later, MOS deigned to inform us that the gate had changed again, and told us the new gate. I walked up to her and said “You are exceptionally rude,” to which she exclaimed “No I’m NOT!” to my back as I was walking away. I will say, while normally I’m not a combative person, she was awful, and I’m glad I was able to provide her on-the-spot, real-time feedback. When I started flying frequently last year I had a choice of airlines. I went with DL because they don’t hate their passengers. UAL does, in my experience. In limited exposure w AA, they are also pretty good. I’ve seen ground staff from both DL and AA board planes to upgrade passengers. Never saw that with others. This is Seattle so these are new hires right? @Luis : no one really needs to memorize theirs. Once you’ve saved it into your online profile it should automatically be filled in at each new booking process. unless the security line was painfully long and snaking around, the time it took to go deal with KTN/Pre was probably more than the incremental wait in the regular TSA line. It’s Delta. I keep coming back because the vast majority of the time I get excellent service whether it’s on the ground, in the air or on the phone. I booked a RT award ticket on Delta from SFO to UIO in J class. 80,000 miles. On the first leg, SFO-LAX I was on Delta in economy. Not a big deal for a one hour flight. The rest of the itinerary was on Aeromexico including the return. and that I would have to fly economy. The $150 was charged to my card as $154+ change. I’m not sure why. Delta also demanded 5,000 miles on top of the $150 fee and $80 to move me out of the middle seat to a window seat. though my trusted traveler number was in their system and I had been precheck on Delta from SFO to LAX under the same reservation number. The security line was extremely long. reaches of the city, not remotely close to the airport, and that people were simply being told to boil water as a precaution which is exactly what you do to make coffee or tea. Nothing consumer-friendly about this experience with Delta. As others have said, that is the STANDARD service at Delta. I have about 150,000 a year with them. I will have 50-75 great (and I mean excellent) customer experiences with employees before I have an average one. Maybe 1 out of 150 will be marginal or bad. I always report great employees to customer service, which happily is nearly every trip, and bad ones as well. The cool thing is, I hear back from management for both the good and bad ones. “We want to encourage and bless the ones who do it best and we want to intentionally train those who need help…or fire them”. Exact quote from the manager. first job involved underwriting loan requests where I produced a 12 page handwritten report. I then gave it to another to type up. Realizing this was not efficient I began typing them up. My colleagues were not happy: ” we did not go to college to be a typist”. Two months later they too were typing their reports. I often wonder if the fear of colleagues disdain prevents more people from doing the “right” thing. That is why the 3 American major carriers never make it to Top 10. Try beating some really genuine Asian hospitality. The “can do” attitude is what they are lacking rather than telling themselves that they belong to the “entitled” mentality. @henry LAX why do you think it’s ok to abuse public servants? While there are bad apples there too, these folks have forgone the rewards of the private sector to serve you. I believe the appropriate response us ‘thank you for your service’ not let me pile a heap of abuse on you so I can feel better about myself. Delta does a mostly great job with customer service. It is what keeps me with Delta and a feature I value greatly. @Lucky I live in Seattle. I switched from Alaska to Delta about 4 years ago. In all that time, I’ve never had a bad experience with Delta customer service, whether in Seattle or other cities. THat includes the first few months where I was completing my status challenge and didn’t have any status. This is why I stick with Delta. All those agents are former Northwest employees, who, in my experience were the best in the industry. This post is a perfect example of how low my expectations your website has become. I would not expect any less from you Ben. If you have problems, just imagine what life is like for us civilians. For example, most of the time first class is not available or connections charge first class for an Embraer which offers no advantage. Believe me, I live in a connection city. We have to connect in order to get to a connection. The big three have basically abandoned us, flying once or twice a day to their nasty hubs. Ninety percent of our flights are now on Southwest, with all the advantages and disadvantages of that. So, it is the big 3 to fly overseas with schedules to benefit the airline (lousy connections) and Southwest everywhere else. No point trying to combine the two since they don’t combine. And about Delta, gimme a break. How many times does someone “need” to fly to Salt Lake City or Atlanta? Good luck to you if you do. But, we can all be delighted that the executive suites of the three American airlines are filled with people making obscene amounts of money. I can certainly see why employees are bitter. There is a special section in hell with seats at a 26 inch pitch, yours doesn’t recline, but the seat in front does, the ever-locked bathrooms stink, infants scream, no water is available “for safety reasons” and the crammed little metal tube waits on the tarmac for all eternity while the seats gradually shrink. I fly every other week across the country on Delta. Maybe it’s because I don’t wear a suit but I’ve been stopped numerous times with, “We are only boarding first class”. Now, I’m in First Class. This happens in ATL too many times. But I fly them internationally as well and they are the best at what they do in the US. Ua seems to be confused so much that I live in their hub city and refuse to fly them. The business lounge in Chicago was so filthy and gross that I gave up my status five years ago and went back to DL. Every so often I’m lured by the higher value of UA Mileage Plus points, lower barrier to the highest elite levels of other alliances, or the better international lounges of basically every other international partner that isn’t SkyTeam. But then I realize I really do value getting to my destination on time and the overall positive customer service I get with Delta. I wish Delta and SkyTeam offered the best of “everything” but in the end, they offer me what’s most important for my travels and the extras are just (barely) enough to keep me loyal when other alternatives tempt me. I agree…flying is getting close to the city bus or subway when it comes to comfort and service. Remember when flying was fun? JetBlue has incredible employees too. I just came back from 6 months in Japan doing about 30 flights on ANA. What a difference. Now that’s real customer service. Returned to the USA yesterday and flew the last leg on United. The difference is staggering. Delta has been fantastic to me during my business travels. While AA and United have some employees that are gems, Delta consistently delivers time and time again. I recently flew in and out of Seatac on Delta and was upgraded on all four of my segments, with only Silver status. If I had my choice of the big three, Delta gets my business. It’s Delta. I could give you internal horror stories of United having been management for the worst employment experience ever, Baghdad was better. My recent experience is that they went way out of their way to credit me a leg I wasn’t going to take due to work, logged it in to my account so I could call back after making my decision in a couple days. Was abrilliant experience. The difference of Target vs Walmart. I have yet, invite years had a bad experience in the ground or air. United only dominates because their prices are lower and people shop by price not quality, always. I shop what ever isn’t United. Delta are the only one of the big 3 legacy carriers I’d ever choose to fly anymore. There’s no way I’d play any games to be an elite with them anymore, but at least they actually have some esprit de corps left, which I can’t say about UA or AA. Ben, you said you were flying out of Seattle, so this may have been vestiges of the old Northwest Airlines culture. NWA is the last US airline I actually enjoyed flying, they always gave me good service, even once getting a free upgrade to business class on an INTERNATIONAL flight from Portland to Tokyo, and I didn’t even ask for it, I simply asked for an exit row seat. She told me they were already taken, crestfallen but accepting it I said thanks and started walking away. She told me hold on, and gave me a new boarding pass in business. Delta employees are #1 at SEA. Can’t really say anything about DL staff. However, as an LX / LH groundstaff working in Switzerland I hardly experienced the mentioned behavior. We try our best to make the passengers travel as smooth as possible. Since airfares dropped significantly in the past two decades – especially compared to the expectations of some customers – the interactions are not always pleasant. Some PAX still expect the same level of service from a time when airfares were quadruple of today’s average ticket price. In particular when it comes to self-check-in or checked baggage allowances (some tickets do not include a free checked bag). However, being friendly & helpful has nothing to do with the paid airfare and is considered to be a basic requirement as a customer service agent. 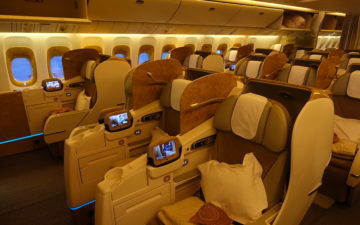 We gladly perform tasks as adding a FQTV Number, seat changes (if possible), direction to lounges, sight seeing tips etc. to enhance the customer’s flight experience, particularly if the passenger asks nicely. I am not saying that one has to beg for a favor, not at all, but maybe consider that flying has become more and more a commodity and is therefore not as “special” as it used to be 20+ years ago. Oh Seattle is a Latrine. It is definitely NOT a Seattle thing . As someone who flies around the world comparing caviar services I totally get your difficulty empathising with peasants who work actually work for a living. I briefly worked for an airline. I a PhD student… So I’m not lazy or thick. But I never had the training or resources of support or time to do anything remotely resembling a decent job. That agent in Houston… That could have been me. Airlines have decided little people (employees, economy passengers) are expendable. Everyone suffers as a result of a short term profit driven system. I’ve been that stressed out, embarrassed, employee. Airlines are moving towards a model where many employees are paid starvation wages. Ask a British Airways recent hire his much she makes before you criticize the quality of the service she’s providing. And then go back to complaining when you don’t get Dom Perignon, or whatever you favorite champagne is. The Caucasian women is nice and professional and the African-American is not. Can you answer please. @ Kent — What are you talking about? try travelling longhaul economy and then you’ll know how bad customer “service” really is, not just FAs, but checkin, on the phone, etc. You’re lucky you get perfunctory service. Ben, I think Kent is interpreting your photos as the top one being friendly and professional, and “caucasion”, even though she’s not; and the bottom one as being unprofessional because she’s “black”. People in that area of the country are so freaking nice! I was blown away by it when I went to Portland and Seattle last year. It was being on a different planet. Lower fares mean the airlines try to get by with fewer gate staff, which puts pressure on one person to perform many tasks. Gate agents are tasked with driving the Jetway, opening the door, arranging for wheelchairs and unaccompanied minors, directing passengers to connecting gates, clearing standbys, checking the new crew, boarding new passengers, gate checking bags, closing the door, and pulling the Jetway all within about an hour per flight. My clients pay for domestic and international first. I fly the three legacy carriers regularly on US domestic, but not international. I will always fly Delta domestically if they operate the route, even if the times aren’t as convenient; they have hands down the best US domestic ground service. Depending on route, if it’s a Canadian flight, AC ground service is pretty good as long as you’re 100k. Your headline and photo of a Delta plane are a bit misleading and unfair. They did a great job on the service side, but the headline suggests “meh.” Not sure that was your intent. Never flown DL and don’t plan to but couldn’t resist saying, that as someone who can spend days communicating in nothing more than emojis, the GIFs in this post are spot on! Bravo! Your experience here and those of many of the comments aligns well with what I’ve experience from Delta and that’s why I’ve ultimately chose them as my domestic airline for my work travels. I started a new job this past year that is entirely ‘field’ based so I’m on the road for a few weeks at a time then a few weeks at home. Flying out of Reno, NV though, I’m not hub captive, and I really could chose between and of the ‘big 3’, Southwest or Alaska as my airline of choice. Southwest was never going to happen for me (no seat assignments, never an upgrade, etc…) but I weighed all my other options and made customer service/reputation and convenience of my inevitable connections coming from a small airport my top priorities. I sure as hell don’t want to fly a route that brings me through LAX, so AA was easy to rule out. DL may not have the best selection of flights, but with such a short flight to their hub in SLC, I really don’t mind it and their customer service is certainly better than UA or AA.